Here are six key takeaways from the Boston Consulting Group’s (BCG) 15th annual report on the global wealth-management industry from its report titled Winning the Growth Game: Global Wealth 2015. 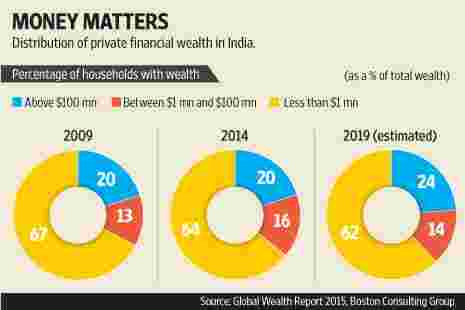 1) Just 928 households own one-fifth of India’s private financial wealth. The number of Indian ultra-high net worth households (households with wealth over $100 million) in 2014 was 928. The percentage of private financial wealth they own is 20%. This measure is projected by BCG to go up to 24% by 2019. 2) Indian households with financial wealth of more than $1 million own 36% of private financial wealth in the country. The share of those with over $1 million in financial assets has gone up from 33% of total private financial wealth in 2009 to 36% in 2014. Their share is projected to go up to 38% by 2019. The BCG 2015 global wealth report doesn’t say how many households in India had financial wealth of more than $1 million. However, their 2014 report said that India had 175,000 millionaire households in 2013. 3) The rate of growth of wealth of those with more than $100 million is projected to be the highest among all wealth groups in the next five years. In India, the wealth of this group is expected to grow at a compounded annual growth rate (CAGR) of 26%. 4) India ranks fourth globally among countries having the largest number of ultra-net worth households. The US remained the country with the largest number of ultra-net worth households at 5,201, followed by China at 1,037, the UK at 1,019, India at 928, and Germany at 679. Millionaire households (those with more than $1 million in private financial wealth) held 41% of global private wealth in 2014, higher than 40% in 2013. Their share is expected to rise to 46% of the global private wealth in 2019. 6) The Asia ex-Japan region is predicted to overtake North America by 2019 in terms of private financial wealth. Asia-Pacific (ex Japan) is expected to grow at a CAGR of 9% from 2014-2019 while BCG predicts North America to grow at a slower pace of 4.2%. By 2019, the Asia Pacific (ex-Japan) region is expected to have 34% of global wealth, up from 29% in 2014. In contrast, North America’s share of global wealth is expected to decline from 31% in 2014 to 28% by 2019.